LONDON, UNITED KINGDOM--(Marketwired - Sep 19, 2017) - According to a new study released by Twilio (NYSE: TWLO) today, 81% of consumers complain that it is difficult to communicate with businesses, but only 34% of businesses acknowledge room for improvement. While most businesses focus their efforts on delivering a great product, too few businesses recognize the significant impact the communications experience has on their brand and revenue. The study finds that after a positive communications experience, 7 out of 10 consumers recommended the business to their friends or purchased more products or services; but one-third cancelled their service or switched to a competitor following a negative experience. Companies can provide a better experience by tailoring their communications to deliver the right message, using the right channel, at the right time. "With all the new communications channels available today, we are seeing consumer expectations shift, but the experiences businesses deliver are not keeping pace," said Devang Sachdev, Director of Product Marketing at Twilio. "To narrow the gap, businesses need to personalize their interactions with customers, improve their responsiveness, and communicate via the right channels." Businesses aren't aware of how poorly they are communicating with their customers. 94% of businesses claim their customers are satisfied with the responsiveness of their communications, yet 96% of consumers disagree. When rating their performance on various channels, companies report they communicate most effectively via email and phone. However, when compared to customers' ratings of these channels, these companies rate their ability to communicate via phone nearly four times higher than customers do and their ability to communicate via email two times higher than customers do. Businesses that offer communications through a mobile app, social media, or SMS rate their performance as "excellent" two times more often than customers do. Consumers expect communications to be relevant, responsive, and on their preferred channels, but many companies aren't delivering that experience. 79% of consumers say that fast response times make for a positive customer experience, yet 89% report that businesses are too slow to respond. 55% of consumers say that communicating with a business via their preferred channel results in a positive experience, yet only 27% of businesses have adopted a fully integrated omni-channel communications strategy which would allow them to communicate this way. 41% of Australian companies, 30% of US companies, and 28% of UK companies report that they do not know what channels their customers prefer to communicate on. Companies with a global customer base have to understand the distinct preferences of consumers in each market and ensure their communications strategy and infrastructure can deliver on those preferences. 42% of UK customers rate communications from businesses as fair, poor, or terrible. UK customers are the most likely to reach out to a business to make a complaint, post a negative review, or request a refund. Australian customers prefer to communicate with businesses via phone more than other regions. They are also the most likely to reach out to a business to make a payment or get information about a product or service. US customers are most likely to recommend a company to a friend or family member following a positive communications experience. US customers are also more likely than other regions to follow or "like" a company on social media after a positive experience. The cost of a bad communication experience can be underestimated by or hidden from a business. 51% of businesses report that they received negative customer reviews as a result of bad communication experiences their customers have had. However, customers are more likely to tell their friends and family (66% of the time) or stop doing business with a company altogether (41%) than write a negative review, actions that may not be as obvious to a company. Generation Z consumers (age 18-21) are the most vocal about their experiences. 79% of them will tell a friend or family member after a negative communication experience compared to 68% of millennials (age 22-36), 67% of GenXers (age 37-52), and 61% of baby boomers (age 53-71). The younger generations are more likely to take multiple actions after a positive experience -- recommending it to a friend, buying more products, writing a positive review, or engaging with the company on social media. Good communication experiences can have a multiplying effect on the business. 97% of consumers will give more business to companies that respond quickly to them. When a customer is extremely satisfied with a business's communication, that company is almost 50% less likely to receive a negative review and 47% less likely to have their customers switch to a competitor. Companies who deliver positive communications experiences are 45% less likely to report sales decreases and 39% less likely to receive negative press coverage. These companies are 2.6 times more likely to have revenue growth of 15% or more. Digital communication leaders have more customers who are extremely satisfied with their communications. Businesses who successfully communicate with their customers share several consistent characteristics. Digital communications leaders recognize the value and impact communications has on their customers' experience and make it a priority in terms of technical resources and budget. When companies make the digital experience a priority, they are 3.8 times more likely to increase budget to ensure that it is a positive experience. Leaders are more likely to have a fully integrated, omni-channel experience for their customers. 40% of digital communications leaders have an integrated strategy. Leaders recognize the growing preference of their emerging customer base to communicate in new ways. 78% of communications leaders know what channels their customers prefer and 72% offer all of those channels. Leaders are more likely to experiment with emerging communications vehicles like messaging apps or video chat in addition to communication through their own mobile app to allow a two-way conversation in real-time. Ultimately, digital communications leaders communicate the right information, at the right time, through the right channel to their customers. For more information about this survey or guidance on how your company can become a digital communications leader, view the report. In partnership with Lawless Research, Twilio reached out to companies and consumers to better understand how businesses are currently communicating with their customers and how consumers would prefer to interact with those businesses. 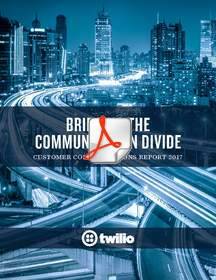 Twilio surveyed more than 2,000 consumers in the US, UK, and Australia about their communications preferences and experiences over the course of the last year when communicating with businesses across a variety of industries through a comprehensive set of channels from email to phone and all digital vehicles. Twilio also surveyed more than 850 businesses in those same markets to understand the communications experiences they provide and how they perceive the customer satisfaction with those.